The excitement is building as most of us eagerly await the start of ‘2012’; the Olympics coming to London. Some of us have been very fortunate to get tickets others, like myself, will be glued to the television screens cheering on our home nation. The Opening Ceremony takes place on 27th July and will be followed by 12 days of equestrian competition. There are just six gold medals available for the team and individual Olympic disciplines of eventing, dressage and showjumping which will be contested for at Greenwich Park. Following a short break the Paralympics begin on the 30th August, the Para-Equestrian Dressage competition will take place over six days with a total of 11 gold medals to compete for in team and individual competitions. Consultant Farrier to the British Equestrian Federation, Haydn Price DipWCF is Lead Farrier for Performance in Dressage and Showjumping. To complete the disciplines, Brendan Murray AWCF B1 is Performance Eventing Team Farrier. This will be Haydn’s 13th year as a Team GB member and Brendan’s 20th. Preparation for 2012 has been ongoing for some time and Haydn engages in a “proactive service looking at both horse and rider combinations” and “looking for performance indicators both on a clinical and a practical level”. Haydn works with the vet and physiotherapist and together complete yard visits of each horse and rider on the ‘long list’ to provide an advisory service, where recommendations are made, fed back to the home team and sometimes, but not always (!) implemented. Between himself, the vet and the physiotherapist it is a “collective decision making process.” During yard visits the regular vet, physiotherapist and farrier are invited to attend so that all necessary information can be collated and the ‘team’ can learn from each other. Recommendations are made but not necessarily implemented. Haydn regularly shoes three of the individual Dressage horses so knows them, their riders and their history, particularly well and the yard visits for these are ongoing and largely ‘complete’. The showjumpers tend to be away a lot more and therefore the yard visits for the long list will begin in earnest in the next couple of weeks. It is a requirement for UK Sport to visit the long-listed horses which will incorporate approximately 30 different yards for the Dressage and Jumping teams alone. At the Olympics themselves Haydn’s and Brendan’s roles become more ‘hands-on’ but also diversified. Horses should come with spare sets of shoes, already fitted and ready to nail on. Both Haydn and Brendan are “self-sufficient” and Haydn has a ‘flight case’ which includes gas and a forge to ensure that they are fully equipped to deal with any scenario. In a nutshell the Games are not the time to change shoeing style but to maintain soundness through to completion. Beyond providing a comprehensive farriery service to the horses during the “11th hour” and the competition itself Haydn and Brendan form an integral part of Team GB. The team is very tight knit and “personalities and scenario’s can escalate” and therefore Haydn and Brendan both fulfill secondary roles within the team to “add a dimension”. Indeed Brendan received a medal presented by the British Equestrian Federation at the International Horse Show in Olympia in 2010 for his contribution to the international equestrian world and was cited by British World Class Performance Director Will Connell as being “the main stay to the stable area, carrying out any job that needs doing and ensures all aspects of the groom’s welfare is attended to” (Fran Jurga’s Hoof Blog, December 23rd 2010). Haydn believes the “home advantage can also be a disadvantage”. Normally travelling away to such competitions you would be locked in to the “competition environment” for some time before hand. On your doorstep there is always the temptation to complete additional tasks and squeeze in a last minute appointment before taking up residence in the Olympic village. The individual, psychological, preparation is important as a collective. Nevertheless it is an occasion very much looked forward to. Only around a quarter of the teams travelling to the Olympics in London will have their own farrier. Throughout the Olympics 120 horses will be participating in the various disciplines and may require the services of a farrier. 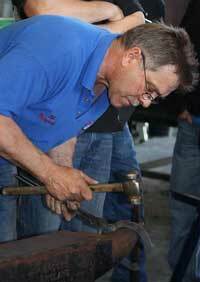 Jim Blurton AWCF will be heading the team of 13 farriers who will be providing around the clock care throughout both the Olympics and the Paralympics. The farriers Simon Persse DipWCF, Nick Deacon DipWCF, Ben Benson DipWCF, Jay Tovey DipWCF, Lee Collins DipWCF, Mark Skippon DipWCF, Rob McIntosh DipWCF, Marcus Thorne DipWCF, Paul Armstrong DipWCF, Jeffrey Newnham DipWCF , James Goddard DipWCF, William Mulqueen DipWCF and Ian Hughes DipWCF will work in shifts from 6am to 2pm, 9am to 6pm, 2pm to 10pm and be on call from 10am to 6am. They will be present in the Forge at Greenwich Park for approximately three weeks at the Olympic and two weeks for the Paralympics. These farriers are working entirely on a volunteer basis and will be dedicated to providing an efficient and prompt service to the best of their ability to ensure each horse and rider can achieve the highest possible placing. This is a tremendous and exciting event to be involved with and we wish them all the very best.